It is extremely fulfilling to make a difference in people’s lives. As a Comstock Park dentist, I have the opportunity to educate patients about the importance of dental health. I also have the ability to give someone a new smile through correcting broken, chipped, decayed or misaligned teeth. By improving patients’ health and appearance, I can also truly change their lives. Cosmetic dentistry patients who never smiled because of embarrassing teeth begin smiling and become more self-confident. This is very gratifying. I enjoy working with people and interacting with my patients and watching their families grow. I have met many wonderful people in my practice and have really enjoyed getting to know them. I love the wide range of interests, vocations, and personalities of my patients. It is a rare day that I don’t learn something new and interesting from one of them. Before opening my cosmetic and general dentistry practice, I attended the University of Michigan, first earning my Bachelor of Arts degree in Psychology and continuing on to the UM Dental School for my Doctorate of Dental Surgery. A famous dental educator said that a true professional is always a student. I have taken that principle to heart and continue to attend continuing education courses around the country. Typically, I take more than 40 hours of continuing education annually. I always strive to provide the most current dentistry using the most current materials and dental technology. While I am a general dentist, I have taken hundreds of hours in continuing education in cosmetic dentistry. In 1990 I was the first dentist in Michigan to be accredited by the American Academy of Cosmetic Dentistry. As a dental professional, it is also very important to be involved in the greater dental community. I am an active member of many organizations including the American Dental Association, the American Academy of Cosmetic Dentistry, the Academy of General Dentistry and the Michigan Dental Association. In 2009, I was awarded Fellowship in the Academy of General Dentistry, a level that fewer than 10% of the dentists in the country have achieved. We have an excellent staff committed to each other and to helping patients achieve good oral health. My first dental assistant and first dental hygienist still work in my office! We provide excellent, state-of-the art care, but we have fun doing it and share laughter every day. Every member of our team is very caring and committed to providing excellent care, but in a comforting and relaxing manner. We are a family-oriented work place, where the employee’s family comes first and all staff pulls together to make sure if someone needs to be off for family, their job is covered. My staff is an amazing group of women who are caring people who have balance in their lives. I am a native of Detroit, and currently live in Ada with my wife. 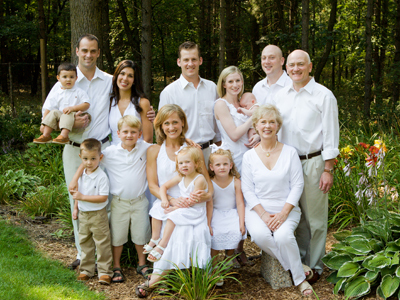 We have three married children, six granddaughters and three grandsons. I enjoy making my grandchildren laugh. They have nicknamed me “funny man”! Aside from spending time with my family, gardening is by far my favorite leisure activity. I also enjoy traveling and playing golf.